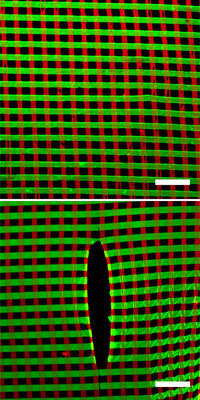 (Nanowerk News) In Nature, cells and tissues assemble and organize themselves within a matrix of protein fibers that ultimately determines their structure and function, such as the elasticity of skin and the contractility of heart tissue. These natural design principles have now been successfully replicated in the lab by bioengineers at the Wyss Institute for Biologically Inspired Engineering and the School of Engineering and Applied Sciences (SEAS) at Harvard University. This nanofabric is capable of supporting a small tear without failing.